This article is about the novel. For the Seymour family seat in England, see Wulfhall. For the television series, see Wolf Hall (miniseries). ^ "Wolf Hall wins the 2009 Man Booker Prize for Fiction : Man Booker Prize news". Themanbookerprize.com. 6 October 2009. Retrieved 11 June 2010. ^ "National Book Critics Circle: awards". Bookcritics.org. Retrieved 11 June 2010. ^ William Georgiades (4 May 2012). "Hilary Mantel's Heart of Stone". The Slate Book Review. Slate.com. Retrieved 6 May 2012. ^ Higgins, Charlotte (15 August 2012). "Hilary Mantel discusses Thomas Cromwell's past, presence and future". The Guardian. ISSN 0261-3077. Retrieved 11 March 2016. ^ Alter, Alexandra (13 November 2009). "How to Write a Great Novel". Wall Street Journal. Retrieved 11 June 2010. ^ McAlpine, Fraser (4 April 2015). "10 Little-Known Facts About the Real Wolf Hall". Anglophenia. BBC America. Retrieved 19 June 2015. ^ Christopher Tayler (2 May 2009). "Henry's fighting dog". The Guardian. London. Retrieved 11 June 2010. ^ Bassnett, Susan (9 February 2012). "Pseuds' Corner: What Makes a Book 'Unpickupable?'". Times Higher Education. Retrieved 24 March 2012. ^ Olivia Laing (26 April 2009). 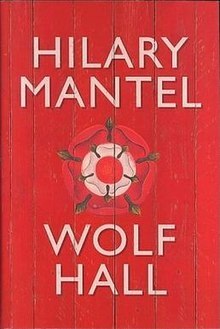 "Review: Wolf Hall by Hilary Mantel". The Observer. London. Retrieved 11 June 2010. ^ Bennett, Vanora (25 April 2009). "Wolf Hall by Hilary Mantel". The Times. London. Retrieved 6 September 2010. ^ "Wolf Hall author takes home Booker prize". China.org.cn. 8 October 2009. Retrieved 11 June 2010. ^ Flood, Alison (1 April 2010). "Booker rivals clash again on Walter Scott prize shortlist". The Guardian. London. ^ "April 5, 2010 Championship". The Morning News. ^ "David Tennant to play Richard II at the RSC". Daily Telegraph. 23 January 2013. Retrieved 23 January 2013. ^ "Wolf Hall - Aldwych Theatre London - tickets, information, reviews". London Theatreland. ^ "Wolf Hall Parts One & Two on Broadway". Wolf Hall Parts One & Two on Broadway. ^ "Wolf Hall adaptation planned for BBC Two". BBC News. 24 August 2012. Retrieved 28 March 2013. ^ "Mark Rylance set for Hilary Mantel TV drama". BBC News. 8 March 2013. Retrieved 14 October 2013. ^ "Review: An arresting presence in 'Wolf Hall'". LA Times. 7 March 1965. Retrieved 6 April 2015. ^ Petski, Denise. "Amazon Nabs Exclusive Licensing Rights To 'Wolf Hall', 'Grantchester' & More". Deadline. Retrieved 11 March 2016.